In the past, public safety forums in Boyle Heights mostly focused on issues related to gang violence and crime. But it seems these days that the homeless, illegal dumping and unsanitary conditions at area parks may pose the greatest threat to public safety. At least that was the view of many residents and stakeholders at a Public Safety Symposium last week hosted by the Hollenbeck Division of the Los Angeles Police Department. A panel of speakers – representing the City Attorney’s Office, LA Sanitation, Northeast Homeless Housing Coalition, Council District 14 and LAPD Hollenbeck officers – was ready to answer questions about issues related to medical marijuana dispensaries and the homeless. They quickly learned, however, that residents are just as concerned about other quality of life issues like illegal dumping and alcohol sales, nuisance vacant properties, graffiti and dirty parks. Throughout the evening, speakers tied trash and illegal dumping to increased vagrancy and crime, a problem that has Boyle Heights resident Nidia Gonzalez worried about her family’s safety. She told the panel that the constant flow of old mattresses and other illegally dumped furniture on her block has attracted more homeless people to her neighborhood. Several people criticized sanitation workers for not acting on the problem fast enough, causing conditions to get out of control. “What does the city do? Are they just relying on the community [to call]? Or do they drive around the blocks to see if there are any bulky items,” one resident asked. The speaker suggested the problem could be solved if city workers identified “hot spots” where bulky items are repeatedly dumped and clean them once or twice a month. Pederson encouraged calling the public works department at (800) 974-9794 to report bulky items left on city streets or using the MyLA 311 smart phone app to request a bulky item pick up, to report illegal dumping, graffiti, dead animals, street repairs or non-working street lights. Several people also took the city to task for its poor upkeep of neighborhood parks. 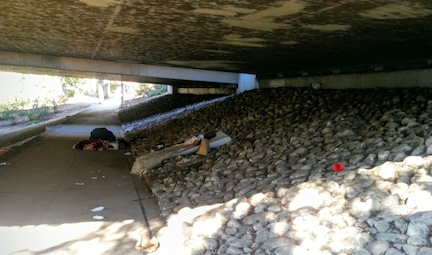 Juaquin Castellanos, a local resident and anti-alcohol licensing activist, blamed the rise in the number of homeless at Hollenbeck Park for its deteriorated conditions. “We don’t want to live in a filthy neighborhood,” he complained. Maria Aguilera lives near the park and said the public restrooms there are now so unsanitary they aren’t safe for children to use, which causes families to spend less time at the park. 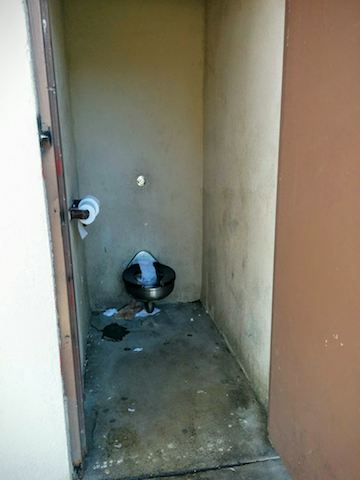 The restrooms “are in horrendous condition,” Aguilera informed the forum panel. Raquel Roman thinks adding more lights could help. She’s been pushing to get more lights installed since March 2014, following a woman being found dead in the park’s lake, but said she just gets the run-a-round. “We called [Councilman] Huizar, we also called the city and Huizar says it’s Caltrans [job].” They just keep bouncing us back and forth, she complained. Evelyn Ortiz thinks the city’s lax enforcement of area liquor stores is adding to the problem. She said the retailers sell alcohol to people already intoxicated and that hurts her neighborhood. The single mother says she doesn’t want her two daughters to see drunken “men exposing themselves on the street. I have to cover my daughters’ eyes” when we’re out walking, she said in frustration. On Monday, Castellanos took EGP on a walking tour of Hollenbeck Park to get a closer look at the unsafe and dirty areas where he said the homeless go to get drunk and sleep at night. He said the homeless men, women don’t clean up their trash, and will leave old bulky items, like a mattress, behind in the park, and it “becomes property that can’t be removed.” He was referring to court decisions that prevent police and city workers from removing property belonging to the homeless without advanced notice and requires the items be stored for a designated amount of time. “People are afraid to run [here] at night because big groups of homeless are here,” Castellanos observed in frustration. At the public safety symposium, residents complained of similar issues at Hazard Park and Prospect Park. Councilman Jose Huizar’s spokesperson Rick Coca was not at the public safety event but told EGP Tuesday that the city “has been handcuffed by legal decisions” when it comes to removing the homeless and their belongings, but did note $2 million in improvements are in the works for Hollenbeck Park. Improvements will include a new playground and filtration system for the lake, remodeled restrooms on the St. Louis Street side and new landscaping. October 29, 2015 Copyright © 2012 Eastern Group Publications, Inc.